Constructing Careers students visited the Grant High School Remodel to learn about green infrastructure and careers in construction from Black professionals who work for Colas Construction, Portland's largest Black-owned construction company. Leah Schrodt and Jeff Johnson from U.S. Fish and Wildlife Service taught Grounding Waters and Constructing Careers students about the salmon life cycle, habitat and anatomy in preparation for co-teaching the topic at local K-8 schools. Grounding Waters and Constructing Careers students learned how to collect data on salmon and its habitat before heading to the creek to collect data. 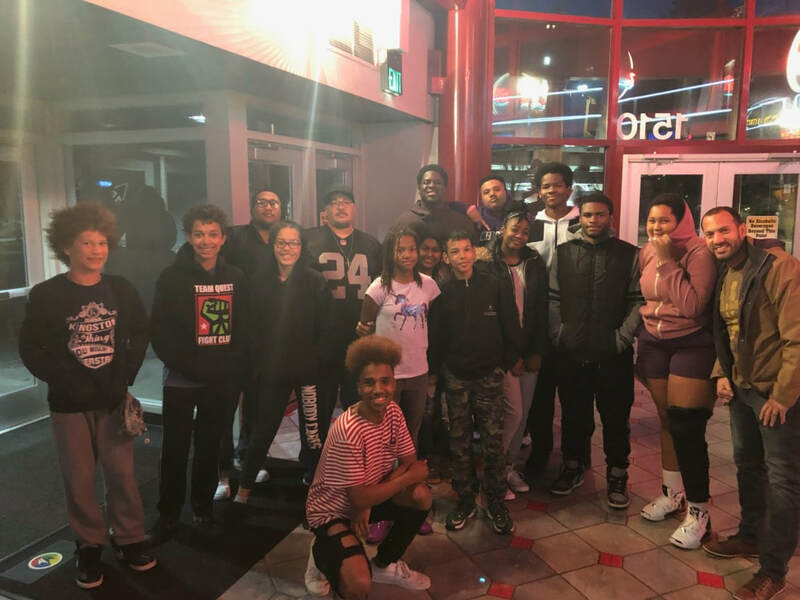 Grounding Waters and Constructing Careers students attended the movie “The Hate You Give.” As part of their positive identity development, we also had a discussion around the social issues addressed by the movie. Constructing Careers students added to outdoor play structures and helped create a garden path at Dharma Rain Zen Center. Grounding Waters and Constructing Careers students took part in ivy removal and mulching in the Cathedral Park adjacent Baltimore Woods. It was a great fall day with great views of St. Johns Bridge. Grounding Waters and Constructing Careers students visited Unity Farm to learn garden preparation and harvesting procedures. Grounding Waters and Constructing Careers students visited Kelley Point Park to learn plant identification from David Grandfield and Yoko Silk of Portland Parks and Recreation. After the learning activity, the group took some time to remove invasive blackberry from the Blueprint stewardship section of the park. Each visit brings the area closer to the native and diverse environment that existed before the invasive plants took hold. Grounding Waters and Constructing Careers students participated in park cleanup at Mt Tabor Park. They removed invasive English ivy to save trees and foster plant diversity in the park. Constructing Careers students participated in depaving of a parking lot alongside members of the Historically Black Fraternity, Phi Beta Sigma Inc.
Grounding Waters and Constructing Careers students participated in a training with Salmon Watch. The students learned activities that they will use to teach elementary school students about water quality, stream ecology, riparian zone ecology and macro invertebrates. Grounding Waters and Constructing Careers students participated in a training and day of data collection lead by Kate Holleran of Metro and Adrienne Moat of Johnson Creek Watershed Council. The students learned beaver facts and research methodology before heading to the creek the next day to collect data regarding beaver activity. 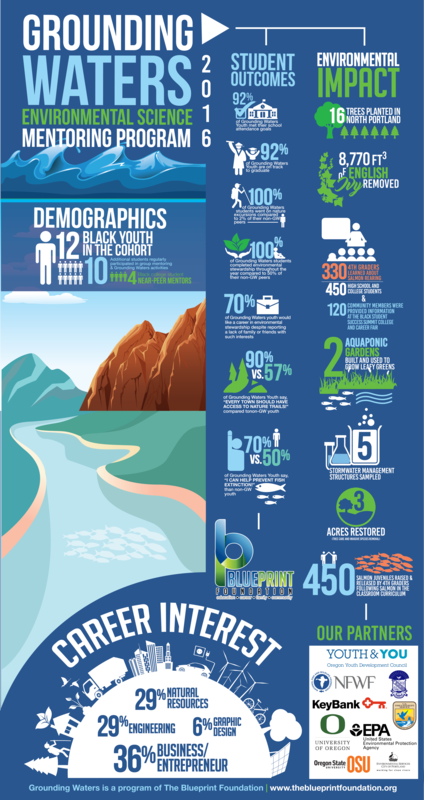 The data will be used to prioritize restoration efforts in the watershed. Constructing Careers students and their classmates from the Constructing Hope Construction Summer Program visited Portland State University to view and learn about various methods of storm water management. The tour began at the Shattuck Hall Ecological Learning Plaza where they were introduced to the topic before walking throughout campus to find and investigate various types of green infrastructure. Constructing Careers students and their classmates from the Constructing Hope Construction Summer Program visited Waste Management's solid construction waste facility in Hillsboro, Oregon. The WM team did a great job of giving the students a comprehensive look at careers in solid waste management including how WM mitigates waste while protecting wildlife areas. Thanks, WM Team! Constructing Careers students and their classmates from the Constructing Hope Construction Summer Program visited Bonneville Dam to learn about renewable energy and environmental protection. The trip was part of their week-long study of green sector jobs in construction. The Blueprint Foundation has joined forces with Constructing Hope, Airways Science, and the NW College of Construction to offer a five-week program in trades skills for underserved youth. Blueprint Foundation's Constructing Careers students took part in the program to learn tools safety, masonry, welding, carpentry, tile work, and other essential trade skills. Blueprint Foundation lead one week focused on environmental literacy and green building. The following photos are from an ice breaker/ team building activity where the students constructed parachutes out of everyday objects. Grounding Waters students and mentors took to the Columbia Slough with the Columbia Slough Watershed Council (CSWC) and Portland Parks and Recreation (PP&R) to learn about the ecology and challenges of the local waterway and how CSWC and PP&R works to maintain the entire river system for future generations of people and animals. Constructing Careers and Grounding Waters students and mentors returned to Dharma Rain Zen Center to complete the pilings for an eco roof at Dharma Rain Zen Center. The project is funded by the City of Portland CWSP grant. Ground Waters students and mentors visited Silver Falls to take part in a nature hike and plant identification activity. The students were given native plant guides and were instructed to identify as many native species as possible during the hike. The top three students with the most verifiable identifications won gift cards. Beyond the chance to hang out with their peers in nature, the trip was exciting for many students, as it was their first time in Silver Falls, and for some, their first time seeing a waterfall in person. Grounding Waters students who completed Daycations with the Intertwine Alliance traveled to TRNWR to demonstrate the use of the Daycation app for residents interested in local opportunities for nature-based activities. Grounding Waters students and mentors attended a night of community learning about the science, technology, engineering, art, and math activities Woodlawn students completed during the 2017-18 school year. Activities included Salmon in the Classroom, where the students dissected eggs and raised juveniles for spring release in the Columbia Watershed. Grounding Waters students and mentors attended a night of community learning about the science, technology, engineering, art, and math activities Boise Eliot students completed during the 2017-18 school year. Activities included Salmon in the Classroom, where the students dissected eggs and raised juveniles for spring release in the Columbia Watershed. Constructing Careers and Grounding Waters students and mentors returned to Dharma Rain Zen Center to complete a bioswale and landscaping at Dharma Rain Zen Center. The project is funded by the City of Portland CWSP grant. Constructing Careers students and mentors returned to Dharma Rain Zen Center to help with construction projects for new dormitories for visitors to the Buddhist Temple. Students learned how to use new tools and techniques for energy efficient housing. Grounding Waters and Constructing Careers students and mentors visited the Garlington Site to learn about green infrastructure and careers in construction from Black professionals who work for Colas Construction, Portland's largest Black-owned construction company. Grounding Waters and Constructing Careers students and mentors spent the weekend in Manzanita, Oregon. For several students, this was their first trip to the coast, despite living their whole lives in Portland. We were excited to see them experience the coast. In addition to cleaning up the beach, we held group mentoring sessions and gaming competitions. Grounding Waters students and mentors contributed to the planting of over 100 trees in St. Johns with the help of their neighbors. Grounding Waters and Constructing Careers students spent the day in the Blueprint Designated area of Kelley Point park planting over 100 native plants. The group will return this spring to continue restoring an area once overrun by invasive blackberry that is now well on its way to once again being biodiverse. Grounding Waters students were treated to an engaging demonstration on salmon life cycles, fish rearing, and egg extraction for fish breeding. Grounding Waters partner, Jeff Johnson of the US Fish and Wildlife Service walked students through a dissection procedure that the students will in turn teach to their younger peers during USFWS Salmon in the Classroom curriculum at local middle schools. U.S. Fish and Wildlife conducted a training on interpretation for educating the public about environmental issues. Grounding Waters and Constructing Careers students will use what they learned to educate their community members about environmental stewardship. They will also use their teaching skills in paid teaching assignments with our partners like the World Salmon Council. Grounding Waters students and mentors contributed to the planting of 220 trees in St. Johns with the help of their neighbors. Grounding Waters and Constructing Careers students visited the new education center at the Oregon Zoo to learn from U.S. Fish and Wildlife Service fish biologist, Jeff Johnson, and Interpreter, Leah Schrodt. Students learned about the interconnectedness of wildlife and the watershed in which they live. How does death after spawning ensure both the stability of the salmon population, as well as the health of the forest ecosystems? How can we eradicate invasive species? Why do methods to protect/reestablish birds differ from protecting/reestablishing salmon? How do beavers ensure that wetlands exist for over half the wildlife and plant population that rely on them to survive? All these questions and more were answered. Grounding Waters and Constructing Careers students visited Kelley Point Park to learn about native species and remove invasive blackberry from a section of the park that they will replant with natives spring 2018. The students also got a review lesson on river confluences and performed a short beach clean up before ending the day. All in all, we tripled our volume of blackberry removed, compared to previous visits to the site. Grounding Waters and Constructing Careers students visited the land fill and restoration area. They learned about career options, sustainable waste management, the science behind protecting the environment from stored solid waste, geomorphology, and wetland delineation. They even had the opportunity to try their hand at wetland delineation. We will return in summer so that the students can see the wetland during the dry season. Students spent the day learning about urban parks and removing invasive english ivy from the site. Grounding Waters and Constructing Careers students spent the day preparing saplings for winter and removing invasive blackberry from the site. Grounding Waters and Constructing Careers students spent the day building a bioswale and learning masonry skills. Blueprint students will return to Dharma several times after this first outing to help Dharma complete their new community meditation space with guest housing. The project is an opportunity to learn trades skills while also learning about green infrastructure. Grounding Waters students took a trip to Mt. Tabor to learn about the challenges of urban park spaces and help with park upkeep. Grounding Waters students put their educator hats on to lead stations during a Salmon River field trip. A large part of the Grounding Waters and Constructing Careers programs is student-led education of the next generation of environmental stewards. The student teachers led activities on macro invertebrates, biodiversity, and salmon life cycles. Grounding Waters students and mentors hopped in canoes and paddled their way up the Willamette to visit Ross Island. Along the way, students learned about the history of the river and island. The tour taught them how and why river systems change over time. They also had a chance to engage in citizen science, taking water samples from the Ross Island Lagoon for an Estuary Partnership Study. Grounding Waters students and mentors used our past field trips to put together two Daycations so that visitors to and residents of North and Northeast Portland can spend a day enjoying the great outdoors and uniquely Portland spaces. The Youth Development Council of the Oregon Department of Education has recently awarded Constructing Careers funding to help students learn about green building, learn trade skills, and complete community improvement projects during the 2017-19 school year. THANKS! Special Thanks to Our Newest Sponsor! The Portland Trailblazers has recently awarded Grounding Waters funding to help continue student development and environmental stewardship during the 2017-18 school year. THANKS! Grounding Waters students, mentors and family members came together to celebrate all the great accomplishments of the students during the 2016-17 academic year. Students received iPads for their efforts and gave short speeches on their favorite activity or project from the year. 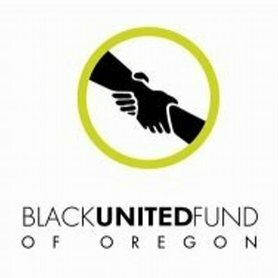 Black United Fund has recently awarded Constructing Careers funding to help students learn about green building, learn trade skills, and complete community improvement projects during the 2017-19 school year. THANKS! Grounding Waters students and mentors took to the Columbia Slough with the Columbia Slough Watershed Council (CSWC) and Oregon State Police (OSP) to learn about the ecology and challenges of the local waterway and how OSP works to maintain the entire river system for future generations of people and animals. Blueprint Foundation and The Black Educational Achievement Movement teamed up with Oregon State Police (OSP) to offer local youth of color a chance to understand the law and law enforcement world of work. Students spent the day learning about the ways OSP protects wildlife, waterways, and communities. We hope the day gave students and officers new insights into how diverse recruits can improve relations between law enforcement and the communities they serve. 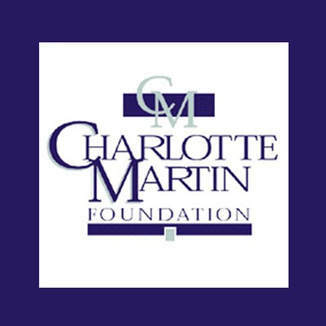 Charlotte Martin Foundation has recently awarded Grounding Waters funding to help continue student development and environmental stewardship during the 2017-18 school year. THANKS! Grounding Waters students and mentors hiked while learning about mammals, reptiles, and birds of the pacific northwest. The hike included experiencing Mya Lin's bird blind. The vertical wooden slats of the bird blind are inscribed with the name and current status of each of the 134 species Lewis and Clark noted on their westward journey. 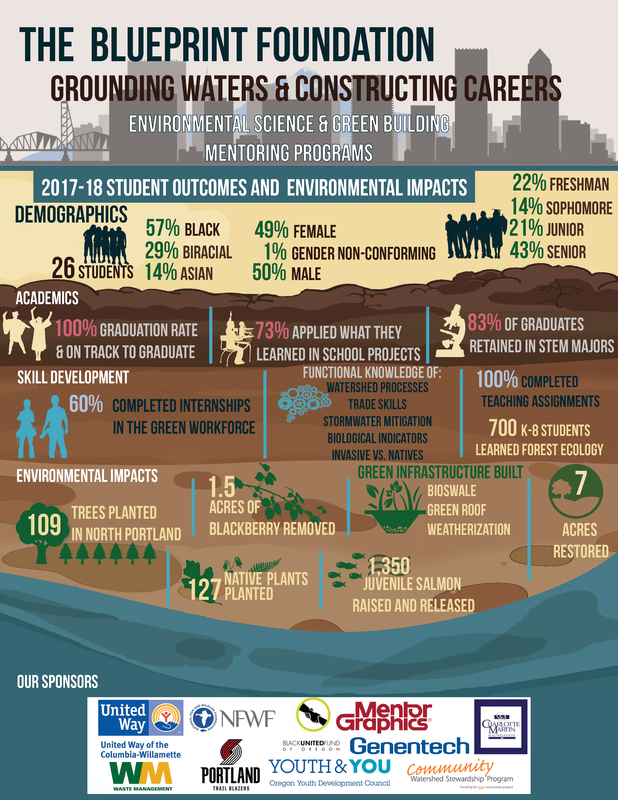 Mentor Graphics has recently awarded Grounding Waters funding to help continue student development and environmental stewardship during the 2017-18 school year. THANKS! Grounding Waters students assisted U.S. Fish and Wildlife fish biologists with a demonstration for 8th grade students at George Middle School in North Portland. Grounding Waters students and mentors attended a STEM youth symposium hosted by PCC and our community partner, historically Black sorority, Sigma Gamma Rho, Inc. The students learned the history of computer science, tried their hand at coding, and tasted compostable materials to see which had the greatest potential to be biofuel. Grounding Waters students and mentors returned to Kelley Point Park. Last time, we learned about confluences, the history of the park, and removed invasive blackberry plants. This day, we planted native plants in the area cleared of invasive. Grounding Waters students and mentors attended a night of community learning about the science, technology, engineering, art, and math activities Boise-Eliot students completed during the 2016-17 school year. Activities included Salmon in the Classroom, where the students dissected eggs and raised juveniles for spring release in the Columbia Watershed. Grounding Waters students and mentors attended a night of community learning about the science, technology, engineering, art, and math activities Woodlawn students completed during the 2016-17 school year. Activities included Salmon in the Classroom, where the students dissected eggs and raised juveniles for spring release in the Columbia Watershed. United Way has recently awarded Grounding Waters funding to help continue student development and environmental stewardship during the 2017-18 school year. THANKS! Grounding Waters students were treated to an engaging demonstration on salmon life cycles, fish rearing, and egg extraction for fish breeding. Grounding Waters partner Jeff Johnson of the US Fish and Wildlife Service walked students through a dissection procedure that the students will in turn teach to their younger peers during USFWS Salmon in the Classroom curriculum at local middle schools. Grounding Waters students and mentors planted 18 trees in St. Johns with the help of their neighbors. The Blueprint Foundation began group mentoring at Benson High School this week. We are excited about the high level of interest by administration and students alike. We look forward to adding Benson students to our career-specific mentoring programs. Welcome Benson HS students! Grounding Waters Students and mentors did early morning birding followed by stewardship. The group wrapped beaver cages around mature trees to prevent beavers from swimming into the park and gnawing on their bark during flood season. Thanks to their work, inhabitants and human park goers will still be able to enjoy these elders of the forested wetland. Grounding Waters students and mentors traveled to Kelley Point Park to learn about invasive versus native species, riparian zones, and how the former wetland became a popular (and dry) scenic area. The students also had the opportunity to see firsthand the confluences of the Willamette River, Columbia Slough, and Columbia River. After the presentation, the group dug up blackberry rootstocks. Grounding Waters students and mentors visited Dharma in North East Portland to learn how the Buddhist Monks and their community volunteers transformed a construction material dump to acres of vital wildlife habitat and vegetable gardens. After an educational tour of the property, the students helped remove invasive blackberry and tended recently installed raised beds. Grounding Waters students and mentors hiked along the lake in search of amphibians while learning about characteristics of prime habitat for the cold-blooded creatures. Grounding Waters students and mentors hopped in canoes and paddled their way up the Willamette to visit Ross Island. Along the way, students learned about the history of the river and island. The tour taught them how and why river systems change over time. Grounding Waters students and mentors traveled to Johnson Creek Watershed to learn about fish habitat and biological indicators. The group also trained in research methods, subsequently collecting data on freshwater mussels for a USFWS data base. Next school year, the students will teach elementary students what they learned in preparation for inviting the students to take part in data collection summer of 2017. Grounding Waters students and mentors went on our annual trip to the coast. Students learned about coastal processes, estuary residing organisms and their habitat. Grounding Waters students and mentors attended Eco-Blitz to learn about wildlife tracking and perform citizen science using the iNaturalist app for cataloging watershed plants and animals. Grounding Waters students and mentors attended a night of community learning about the science, technology, engineering, art, and math activities Boise-Eliot students completed during the 2015-16 school year. Activities included Salmon in the Classroom, where the students dissected eggs and raised juveniles for spring release in the Columbia Watershed. Grounding Waters students and mentors attended a night of community learning about the science, technology, engineering, art, and math activities Woodlawn students completed during the 2015-16 school year. Activities included Salmon in the Classroom, where the students dissected eggs and raised juveniles for spring release in the Columbia Watershed. Grounding Waters students and mentors removed and mulched english ivy from 35 conifers. Each tree now has a 6-foot radius buffer from the life endangering ivy. Grounding Waters students and mentors removed and mulched english ivy from 22 conifers. Each tree now has a 6-foot radius buffer from the life endangering ivy. Grounding Waters students and mentors attended the BSSS 2016 to learn about college and career options from Black professionals. The Blueprint Foundation, Grounding Waters table in the college and career fair spread the word about environmental stewardship as a both civic engagement and a rewarding career. Grounding Waters students assisted U.S. Fish and Wildlife fish biologists with a demonstration for 4th grade students at Woodlawn and Boise-Eliot Schools in North Portland. Grounding Waters students assisted U.S. Fish and Wildlife fish biologists with a demonstration for 4th grade students at Oakley Green School in North Portland. Grounding Waters students and mentors spent the day planting sixteen trees in North Portland. Grounding Waters students were treated to an engaging demonstration on salmon life cycles, fish rearing, and egg extraction for fish breeding. Grounding Waters partners, Sean Connolly and Jeff Johnson of the US Fish and Wildlife Service walked students through a dissection procedure that the students will in turn teach to their younger peers during USFWS Salmon in the Classroom curriculum at local middle schools. Grounding Waters students and mentors visited a distributor of aquaponic garden supplies. The purpose was to see various types of garden set ups, learn the benefits of aquaponic gardening to conservation efforts, and select a set up that they will use to grow a garden in their schools. The students will educate their community members about aquaponic gardening at upcoming community social events. As an introduction to their water quality sampling project, the Grounding Waters students were lead on a walking tour of stormwater management structures around Portland State University. The tour and water sampling project are being implemented in collaboration with Randy Belston, who is a manger of field operations for the City of Portland Environmental Services, Water Pollution Control Lab (WPCL). During the weeks following the tour lead by Randy, Grounding Waters students will complete a scavenger hunt for green infrastructure, using smart phones to document stormwater management structures in their neighborhood. Additionally, students and mentors will take multiple water samples from stormwater management structures to be analyzed by the WPCL. Following the sampling, students will receive a debriefing on the differences in pollutants as a function of type of structure, traditional or green, from which the samples were taken. Grounding Waters students joined other volunteers at the refuge to remove sapling support structures on recently planted natives. A great time was had by all. The cohort will be back at the refuge in winter and spring to plant trees and remove invasive species. Grounding Waters has been featured on the Environmental Protection Agency Blog About Our World! Read it here. ​Grounding Waters students visited Bonneville Dam, then went on a hike at Multnomah Falls. The activity is the first preparatory activity for their work as educators helping US Fish and Wildlife teach middle school students about salmon life cycle during the "Salmon in the Classroom" lab exercises. We have a new discipline specific mentoring program in the works for computer science. We are on the lookout for Black professional and college student mentors in computer science and electrical engineering who are willing to help Black youth get interested in their discipline. Check out our mentor page for more details on being a mentor.